TMS? Three Mile Sprint? lol how active have you been? He's returned to Islam mate ages ago this is old news. He created another account, Zen Baphomet, talked a whole load of atheist, anti-Islam nonsense and left both it and his main account on the same day. So then he has remained a muslim ever since he returned? Yep but he has left the TSR but i know him on Facebook so. also i met him Irl. I think he's ok atm i haven't been able to talk to him for a bit. He also said he isn't going to tell his family he has returned to Islam. 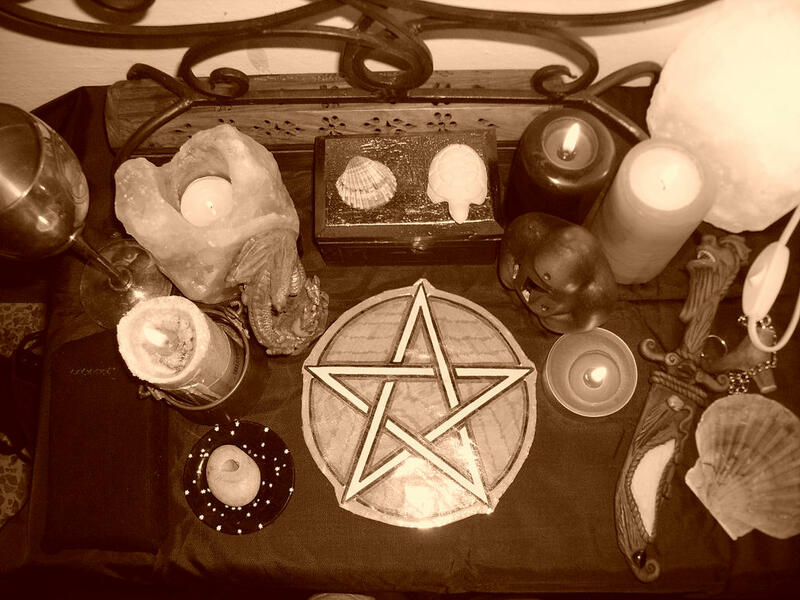 hmmm that could be a wiccan alter not all pagan paths use the pentagram if at all such as the nordic path and the greek path don't use it at all. So how does your paganism differ to that of wiccans and which path are you. Simply put Paganism itself is not one faith. the term Paganism is an umbrella term under which there are Pagan faiths. I prefer to believe in multiple gods lets go with Polytheist. If we're honest, they're all reconstructions to a degree - while we've still got some of the basis for each faith, not all of it survived, and methods of worship etc. are extrapolated from educated guesses from archeologists and the like. In truth yes however i use the names they prefer. And also from what books we actually have on the matter e.g Roman Reconstructionists can use books by Cicero and Cato if the gods are in the books as an idea. Sorry to disrupt the thread, I just wanted to let you all know that the Pagan society will be moving to a new home this afternoon! We have set up a Faith and Spirituality forum for religion societies and threads as the current location in the Debate forum isn't suitable for the support/social purpose of these threads. The new forum sits in Life & Style and can be found here: http://www.thestudentroom.co.uk/forumdisplay.php?f=1205 and anyone attempting to troll/debate can now be redirected to the Religion forum in D&CA instead! Tbh i am the only member that is active haha so tbh this is less of a support thread and more a cave where people who are interested may post. Are there any interesting or important pagan festivals coming up? we've had eostre hmmm tbh i myself dont know many myself hmmm I'm actually gonna try learning old english and old norse and hopefully that'll help with germanic paganism. Quite a few different paths have a celebration around May-Day do they not?